You are currently browsing the tag archive for the ‘tiny art’ tag. Here is my latest acrylic painting that I did on a tiny canvas. This photo is based on sunflower photos I took in Brentwood in 2014 and the Bladensburg Waterfront Park two months ago. I did this painting to sell at my church’s auction earlier this month. It failed to sell so I’ll probably try selling it at future events. Like I wrote earlier, I’m participating in two separate events at this weekend’s Greenbelt Labor Day Festival in Greenbelt, Maryland starting this afternoon at 1 p.m. (when the Art Show formally opens to the public for the first time). I took advantage of the four-artpiece limit by displaying a combination of old and new art, starting with my acrylic painting, Desire. Desire is the oldest of my paintings in this show. 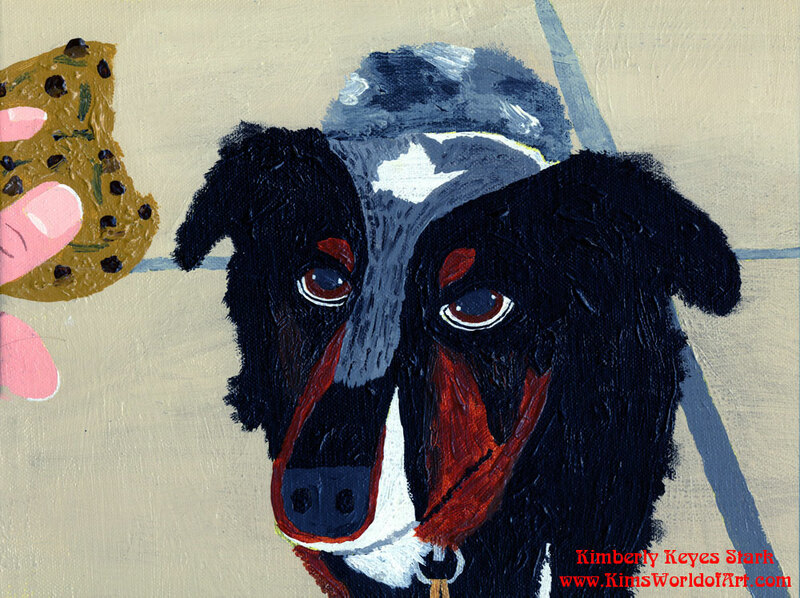 It was the one that I originally painted while I was recuperating from my hip replacement back in late 2008 based on my photograph of my in-laws’ dog, Jay-Jay, while he was begging for a snack that I was eating at the time (during one of my many visits to their home in Phoenix that I made with my then-husband before our marriage broke up). I originally displayed this painting at Artomatic in 2009 then I gave it to my husband’s mother and step-father as a Christmas present later that year. (We gave it to them during a visit over the Thanksgiving holiday weekend.) My mother-in-law passed away in 2010—just four months after we gave them that painting. When my husband’s step-father decided to move to a smaller apartment in a retirement community during the summer of 2011, he had to drastically downsize his possessions so he gave the painting back to us. When my husband left me in late 2011, that painting was among the many things he had left behind with me. I’ve displayed Desire at a few local shows in the years since (the most recent was the one in Baltimore last summer) but this will be the first time this painting will be displayed at the Greenbelt Labor Day Festival. You can read more about the making of this painting in a blog post I wrote back in 2011. The second artwork is a piece I did for a contest last year where we had to create our art using a tiny canvas. I decided to submit that to the Art Show as well. Here is my piece titled Carousel Horses at Night. You can read more about how I made this tiny painting in a blog post that I wrote last year. In addition I created two new pieces. So far I’ve uploaded pictures of them on my various social media accounts. Here are a couple of Twitter tweets I made very shortly before the final submission deadline yesterday. I really didn’t have much time to write anything in detail about these pieces. I’ll write more about these two pieces in a proper blog post at a later date. In addition to the Art Show, I also intend to submit a couple of items I knitted to the Retro Town Fair, which will only be opened to the general public tomorrow from 2-4 p.m. Both are doll outfits that I managed to finish knitting last year and I made an unsuccessful attempt to sell them on eBay during the winter holiday season. The first one is a fur coat that I knitted using funky novelty yarn. This one is supposed to fit Barbie and other 1/6 scale dolls. This coat can also fit 1/6 scale dolls with large heads, such as this Blythe doll who’s modeling this coat in the photo below. You can read more about how I made this coat while viewing photos of other dolls wearing it in a blog post I wrote last December. Last, but not least, is this outfit I knitted for 18-inch dolls (such as American Girl). Here’s a photo of Addy Walker modeling this outfit. You can read more about how I made this outfit while viewing photos of other dolls wearing it in a blog post I also wrote last December. For information and directions to the festival, visit the festival’s official site. I did this tiny art piece as an entry in a tiny art contest that was sponsored by a local arts and crafts supply store in Hyattsville. 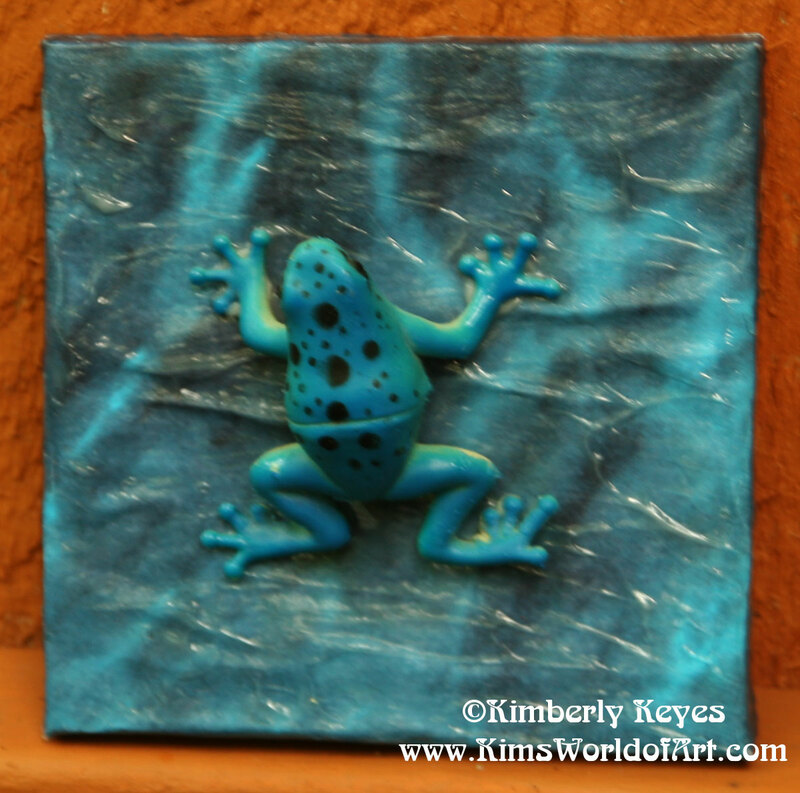 The basic rule is that one must buy a small 3 inch x 3 inch canvas and use it to create art using any kind of media. I’ve done tiny canvases before but I’ve done either mixed media pieces using Shrinky Dinks and/or other items (such as beads) or I’ve shrunk photos of my original art down to tiny canvas size so I could print it out and glue it to the canvas. This is the first time I’ve ever attempted to do a straight acrylic painting on such a small canvas. This piece is based on a photo of a carousel I took at night at the recent Greenbelt Labor Day Festival. I basically shrunk the photo down to the size of the canvas on the computer then printed it out. Meanwhile I underpainted the canvas in black. I then proceeded to draw a grid on both the printout and the canvas in the same size (I used a white colored pencil for drawing the grid on the latter since it was already painted black). I attempted to draw the picture within the grid on the canvas with my white colored pencil but, for some reason, I couldn’t get the lines to show up at all while I barely got the grid lines to even show up. The surface of the underpaint just wasn’t conductive to draw on with a pencil. Instead I decided to just paint each grid with acrylic paint using very small brushes that are sizes 1/0, 2/0, and 10/0. After I finished painting I added a few layers of clear acrylic gloss gel in order to give it a kind of sheen similar to what one sees in oil paintings. Finally I sealed the whole thing using a gloss varnish. I worked on this canvas through the Labor Day holiday weekend as well as the first couple of days after the holiday. It was very painstaking work full of details but it was a very satisfying effort. This morning I’m scheduled to take part in the annual Holiday Craft sale at Paint Branch Unitarian Universalist Church in Adelphi, Maryland starting at 11:30 a.m. and will last until sometime between 12:30-1 p.m. depending on how many people are still browsing the vendor tables. For those of you who can’t make it, I’m selling some of my work online. Today is the 31st and final day of my special Holiday Sales hype in this blog. And I’m determined to have this series of posts end with a big splash (so to speak). 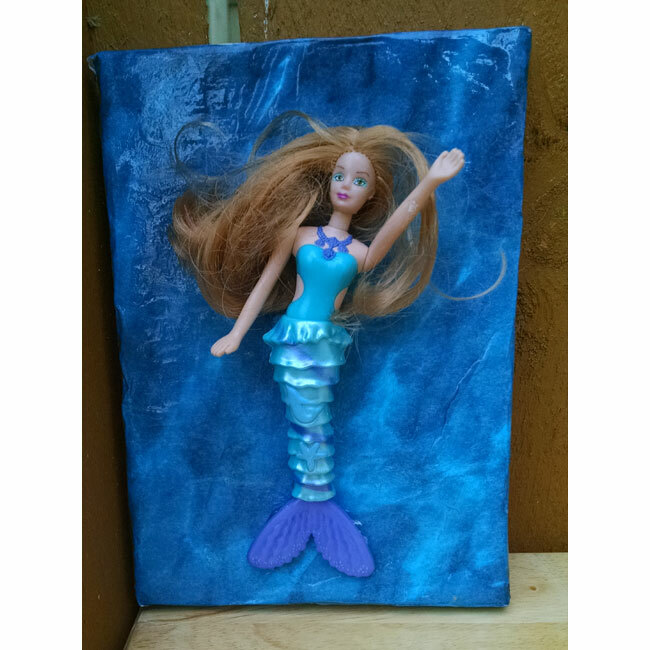 This is a Mermaid Barbie and she’s a mixed-media piece. I originally found this doll in a thrift shop. At 5 inches (13 cm) tall she is smaller than the usual Barbie doll but she still has that unmistakable face. It’s possible that she may have been a Happy Meal toy or something similar. I took a canvas that measured 7 inches x 5 inches (18 cm x 13 cm) and covered it with a layer of scrapbooking paper that had a watery scene. 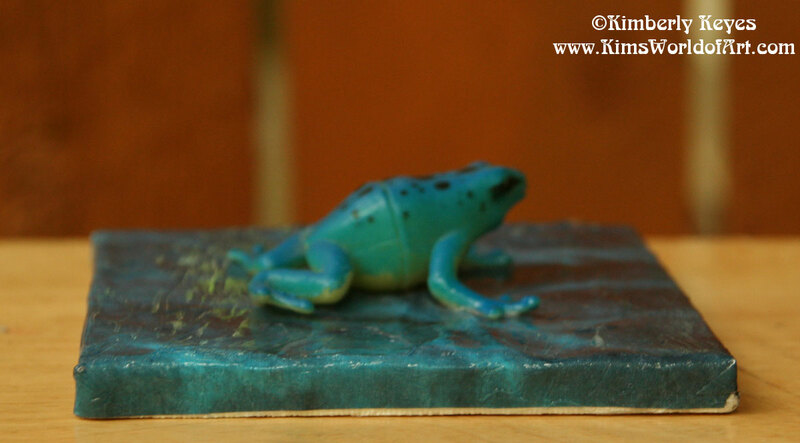 Then I covered that with a layer of acrylic gel and I attempted to texture it in order to simulate waves. 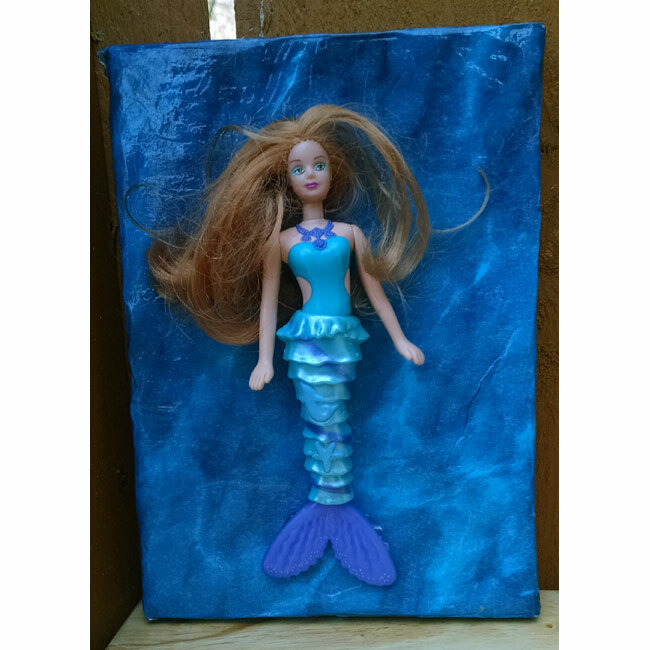 Once that layer dried, I took some more acrylic gel and glued the mermaid’s tail to the canvas. 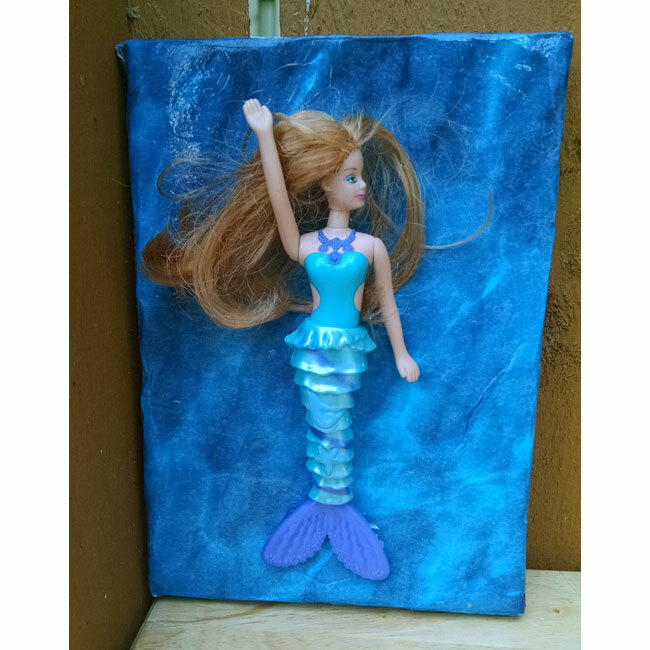 I only glued her by the tail so the owner can have the choice of posing her any way that he or she wants (as I attempted to show in these photos). You can now purchase this unique one-of-a-kind art right here. I currently have this off-beat tiny art illustration on sale in my Etsy shop. Yes, I originally drew this when Spike the Hedgehog was still alive and lived with me. 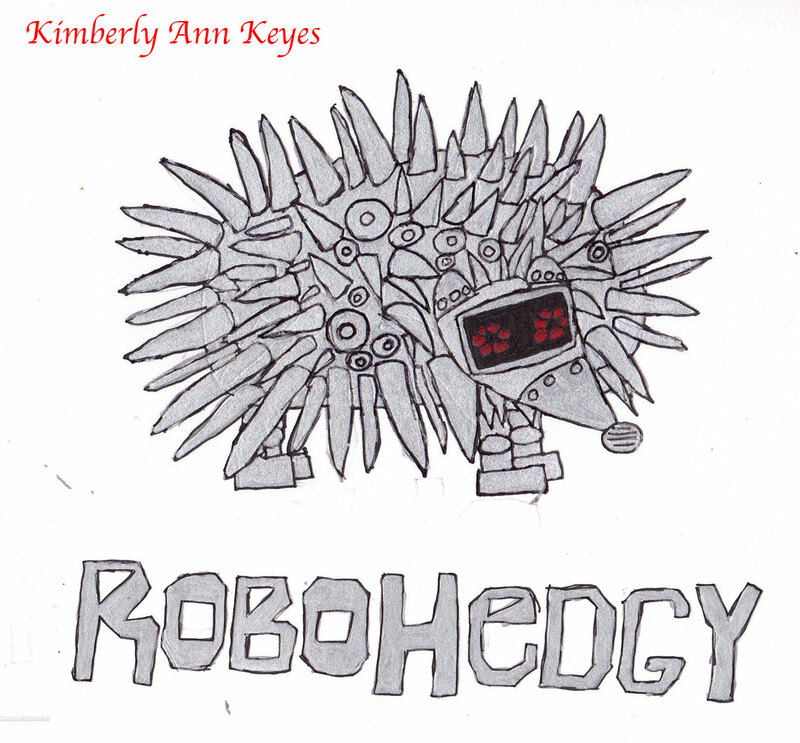 I’ve seen people try to create robot dogs (such as Sony’s AIBO) but I began to imagine what if someone created a robot based on a hedgehog and this was the result. I subsequently scanned it into the computer, resized it, printed it out on quality paper, and mounted it on a tiny canvas. RoboHedgy measures 4 inches x 4 inches (10 cm x 10 cm) and it’s especially for art lovers with limited display space and a limited budget. If you like hedgehogs, robots, or are looking for something unique and different, you can buy it right here. Today is Small Business Saturday where people are encouraged to shop locally owned small businesses. I am a small business (or I’m trying to be one) so if you’re looking for something special on this special day, you’ve come to the right place. If you’re looking for unique reasonably-priced one-of-a-kind art that doesn’t take up a lot of space in your home, I have this piece currently on sale in my Etsy shop. This art is very small so it’s perfect for people with limited display space. It’s also the ideal gift for people who are into skulls. For more information about this piece, read the post I originally wrote on October 20, 2010. 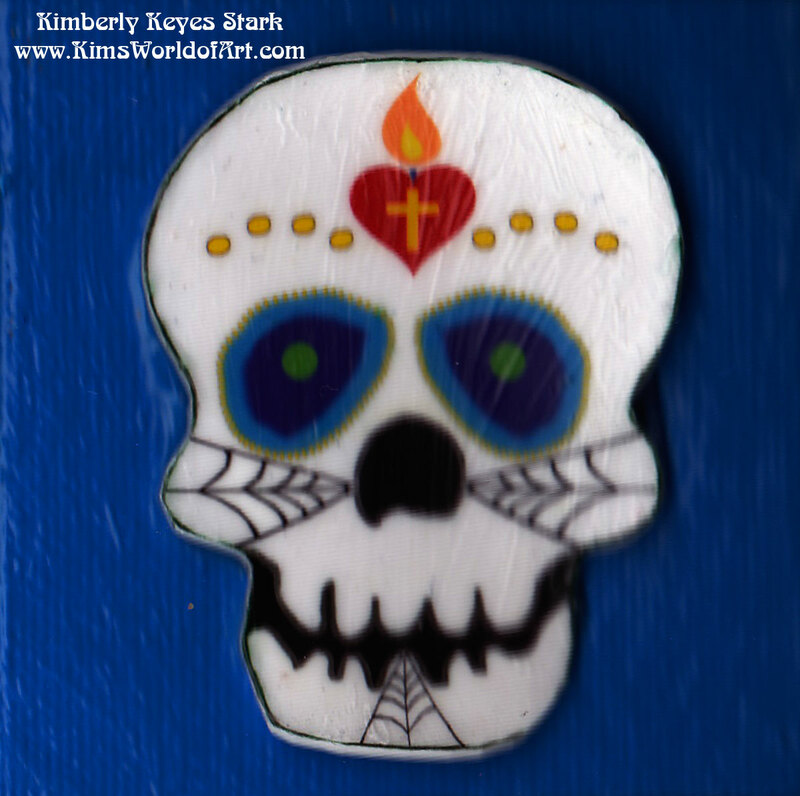 You can order this skull art right here. If you’re looking for unique reasonably-priced one-of-a-kind art that doesn’t take up a lot of space in your home, I have this piece currently on sale in my Etsy shop. This art is very small so it’s perfect for people with limited display space. 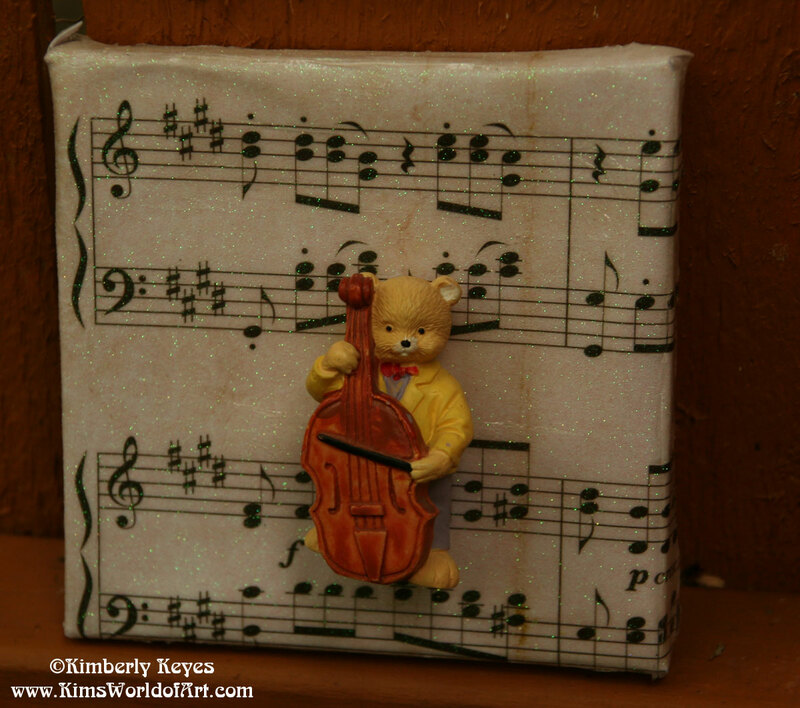 It’s also the ideal gift for people who are into teddy bears, music, or both. For more information about this piece, read the post I originally wrote on June 5, 2013. You can order this tiny art right here. This art is very small so it’s perfect for people with limited display space. It’s also the ideal gift for people who are into teddy bears, music, or both. For more information about this piece, read the post I originally wrote on June 6, 2013. You can order this tiny art right here. This art is very small so it’s perfect for people with limited display space. It’s also the ideal gift for people who are into skulls. For more information about this piece, read the post I originally wrote on October 24, 2010. 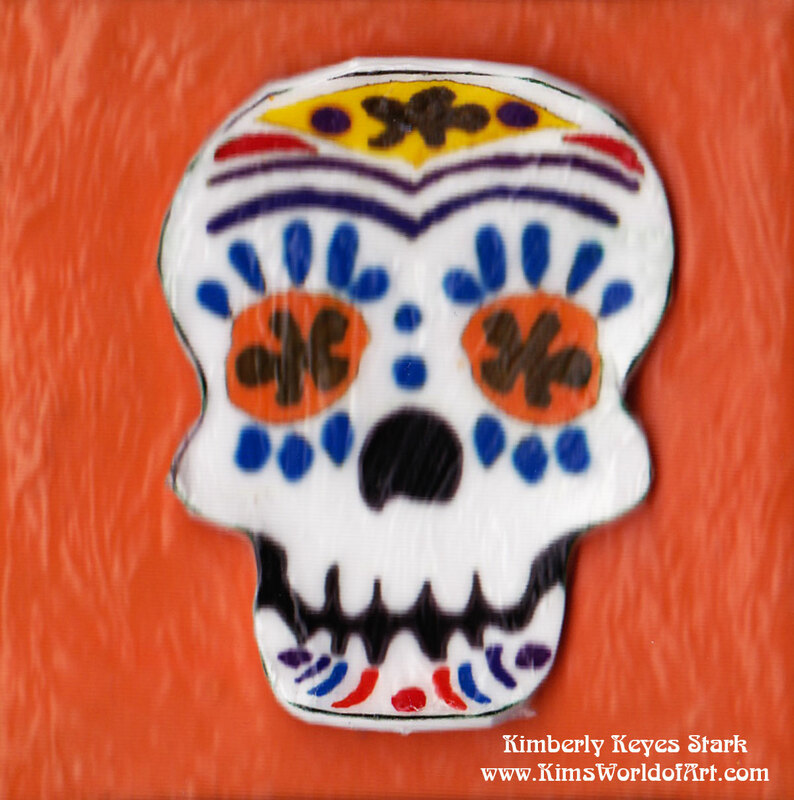 You can order this skull art right here.